Girls Talk Math started at the University of North Carolina at Chapel Hill in 2016. The UNC camp serves students in the Triangle and surrounding areas. In 2018 the program expanded to the University of Maryland at College Park. Check out their website for more math camp fun! Our approach is based in an understanding of the barriers preventing young women from entering mathematical fields, including a failure to see themselves represented among mathematicians, lack of confidence in their abilities, and less encouragement from peers and teachers. The myth that mathematics has historically been done only by men can contribute to internalized beliefs that women are less capable of success in these careers. In researching the lives and work of women who have made significant contributions to the field, students will see their own potential to have careers in mathematics. We aim to increase confidence by giving students a voice and a platform to be heard through the blog and podcast series. During the camp week we bring local students and instructors together, building a supportive and inclusive community of peers and mentors. Francesca received her Ph.D. in Applied Mathematics from the University of North Carolina at Chapel Hill. She is now a Dean’s Postdoctoral Scholar in theDepartment of Mathematics at Florida State University. While at Chapel Hill, she also received a Graduate Certificate in Women’s and Gender Studies focusing on underrepresented minorities in STEM. Find out more about Francesca’s work and interests at www.fbernardi.info or follow her on Twitter @fra_berni. 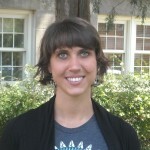 Katrina is in the fifth year of the Pure Mathematics Ph.D. program at the University of North Carolina at Chapel Hill. Her youth outreach experience includes program development at Fort Bend County Women’s Center and volunteering with Girls Rock NC. Learn more about her work and interests at www.morgank.info. Dr. Christianson is an Associate Professor of Mathematics at the University of North Carolina at Chapel Hill. He also serves as the Diversity Liaison for the Mathematics Department. This program is funded by the MAA Tensor Grant Program for Women and Mathematics. Through this grant the Mathematical Association of America funds projects aimed at encouraging young women to study mathematics. Funding is available to college and university faculty or primary school teachers working with college or university faculty. We are honored and excited to have received this grant.